Dimensions and Funds are very powerful tools for financial tracking and analysis. These are well covered elsewhere in manuals and training documents when it comes to use, entry, and review. However, one thing I have found that is not covered very well is how dimensions on individual transaction lines of documents interact and relate to the rest of the system. This small post will cover that key understanding and some of the implications. Some fields are Serenic Navigator specific (“Fund No.”), but the general topic applies to all NAV installations. For our discussion we will use purchase orders as example documents and look only at Vendors, but the same thought process applies to Purchase Requisitions, Sales Orders, Invoices, and even Credit Memos. Something else that may have stood out between these two ledger entry screens is that Vendor Ledger Entry does not have Fund, Department, Project, or any other dimension columns. This is because the Vendor Ledger Entry is the entry for the whole of the document, which has no Fund/Dimension information on it (depending on system configuration). The Detailed Ledger Entries are reflections of the line amounts, which are also reflected on the GL. And of course, as most of you should know, you’re able to filter on the General Ledger and General Ledger related reports in much the same way. What is quickly apparent is that the Fund Number and Department from the lines cannot be displayed on the document header. 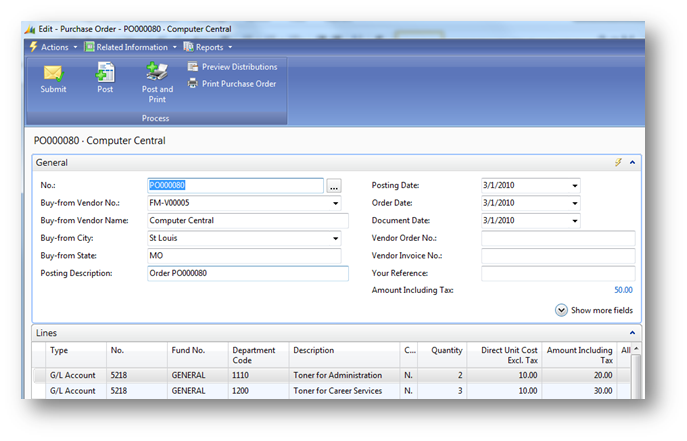 Because it is possible to have multiple departments and multiple funds on the lines, allowing for greater flexibility, it is not simple to display or filter on line-based information in the header. Featured Posts, NAV Usage Dimensions, Navigator, Serenic. permalink.